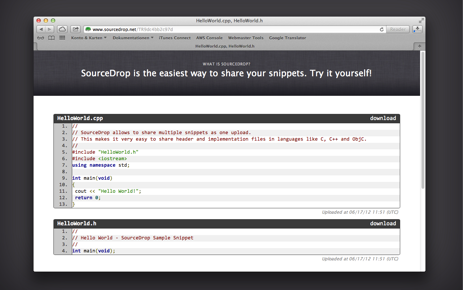 SourceDrop is the easiest way to share your snippets. Try it yourself! 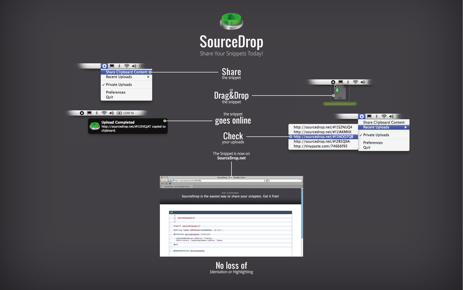 SourceDrop is a PasteBin client which allows you to easily share your snippets by drag and drop. Just drop your snippet on the SourceDrop icon and it will be uploaded to the configured PasteBin provider, supporting all common PasteBin providers like TinyPaste, PasteBin.com and GIST. After you grab our App make sure you Subscribe to our newsletter to get all of the latest news and updates about our Apps. Why do I need SourceDrop? Have you ever had to send a source snippet via instant messaging or social networks? Using SourceDrop allows you to send snippets without losing indentation or highlighting. Just drop the snippet on the SourceDrop icon and send the created link. At the moment we support TinyPaste, PasteBin.com and GIST, but if you miss your favorite service we would happy to get in contact with you. SourceDrop supports to upload multiple snippets as one paste. Use this feature to share header and implementation files with one link. Have a look at the sample snippet if you are interested in a demonstration of the possibilities of this service or just try it yourself. Uploaded pastes are stored on the servers of the chosen paste bin service and all you need to share is the created link you receive from the app.